PCCW has about 82 percent of the fixed-line market in Hong Kong. HONG KONG, China (Reuters) -- Hong Kong's dominant fixed-line phone company PCCW Ltd has posted a net loss of almost $1 billion in 2002 after losing market share and booking writedowns on two businesses. The company, headed by 36-year-old Richard Li, son of tycoon Li Ka-shing, reported a net loss of HK$7.76 billion ($995 million), compared with a restated net profit of HK$1.34 billion in 2001. The loss was slightly above analysts' estimates of about HK$7.55 billion. Shares in PCCW closed Thursday at HK$5.05, less than half the one-year high of HK$10.50 seen in May last year. 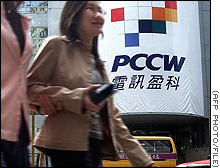 PCCW had net debt of about HK$32.9 billion ($4.2 billion) at the end of 2002. It said it won't begin paying dividends in 2004, having said last year it would consider a 2004 payout yielding as much as 4.5 percent. "They need their money to pay down debt," said Voon San Lai, an analyst at BNP Paribas Peregrine. "It's a better use of the cash than to pay a dividend." Chief Operating Officer Mike Butcher told Reuters the company would focus on paying down debt and improving the company's operations. He said PCCW expected to stop the decline in revenues, which fell eight percent in 2002 to HK$20.11 billion, predicting 2003 turnover would be steady or above last year's levels. "Last year was a cost story of getting our cash flow in great shape," he said. "This year is a growth story, but we're going to work at it and continue to produce solid results." PCCW underwent major restructuring in 2002 to tackle the debt it assumed in 2000 when the one-time Internet upstart acquired Hong Kong's former phone monopoly for US$28.5 billion. The results accounted for a write down of HK$8.26 billion, equal to about 70 percent on its stake in Reach, a struggling undersea cable venture with Australia's Telstra Corp. Telstra wrote off its entire investment in Reach. PCCW said it does not expect further writedowns on Reach. It also booked a 2002 loss of HK$1.77 billion from the sale of its 40 percent stake in Hong Kong mobile carrier CSL. Butcher said PCCW would reverse falling revenues by bolstering sales of its products, such as videoconferencing and wireless broadband services. The company estimated it controlled about 82 percent of Hong Kong's fixed-line phone market at the end of last year, compared with about 89 percent a year earlier, and 87 percent in the middle of 2002, according to Merrill Lynch. The company's shares have dropped steadily since early 2000 on a perception it lacked growth prospects and worries about its heavy debt. In 2002, PCCW fired nearly 900 workers, moved 1,500 to outside contractor status and spun off a quarter of its remaining employees into a new unit called Cascade. The company said it has set a goal of reducing debt by a further HK$7.8 billion by 2005. Li said that uncertainty in the global political and economic situation has led PCCW to focus on strengthening its balance sheet. He added that despite deciding not to pay a 2004 dividend, PCCW's objective "remains to pay a dividend in the medium term."